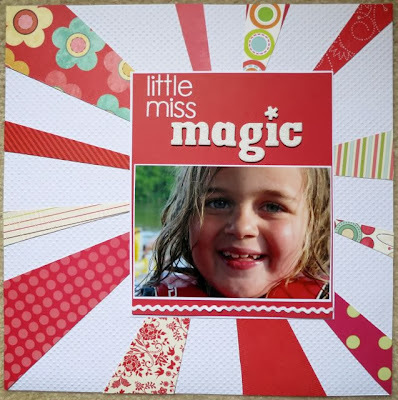 "Lasting Memories" Scrapbook Layout Challenges: Friday Features!! Oh my gosh is it Friday? Boy these weeks are flying by! So fast that I am hitting you all with today's post a bit later than usual. But hey... inspiration is inspiration any time of the day. Right? With that said, here are some awesome layouts from our readers and our very own Lasting Memories OWNER, Karen. :) Woo hoo. The scrapping bug has hit! KAREN Stickers, Diecuts and chalkboard embellies. Oh MY!! JACKIE Love the rule of 3's!! 3 very different alphas in her title. Love!! WENDY Sunburst gets me every time. Cute alphas to go with CUTE title!! Perfect Michele! What fab LO's!